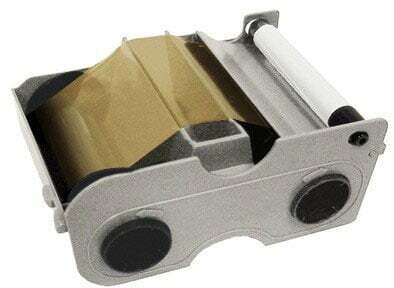 Fargo Ribbon - Silver Metallic EZ Cartridge with Cleaning Roller, 500 images per roll. The ribbon is used to print in one monochrome color: Silver. This ribbon is used to print text and one-color images one or both sides of the card. Compatible with C50, DTC1000Me, DTC1250e, and DTC4250e. This part is also known as 045131. The Fargo 45131 is also known as Fargo Electronics	FGO-45131	.